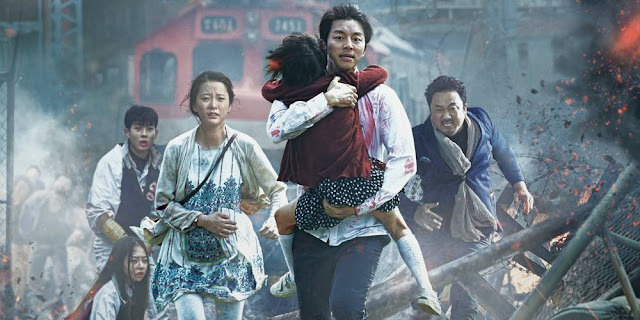 Confused Boy: Not your everyday train ride; Train to Busan. Not your everyday train ride; Train to Busan. This post was written right after I watched the movie, Train to Busan. Before I start complementing how great the movie was, I have a story to tell, also regarding the movie. Some movies, after the credit, they will feature end scene which will tell viewers what actually happened after the movie ends. So, the people who watched the movie with me must have suspected because a lot of them stayed until the end of the credit. Unfortunately, there was no end credit scene. As I said before, a lot of them stayed until the end of credit for that scene, ended up sighing It was damn hilarious to hear their disappointment and see their frustrated faces. But then again, it's a sign how great the movie was that people want more! Even though it was nearly 2 a.m.
Now back to the movie again, this is not your typical Zombie apocalypse movie, not its not! It was horrifying, yes. It was thrilling, yes. It was full of action, yes. But the movie producer added one fantastic, touching element, LOVE. They included love between friends, love of couples, siblings love and of course, love of a parent towards his child. All in all, I would say this is a Zombie apocalypse masterpiece! This is not your train to bosan, it is a hell scary yet addictive journey kind of a train ride, the Train to Busan!